Onofrio's Great Fountain is the first sight your eyes are drawn when you enter the Old Town via Pile Gate. 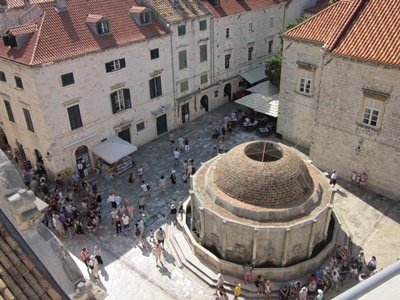 This fountain was constructed in 1438 to bring water from the River Dubrovacka, located some 12 km away. It was designed by architect Onofrio Giordano della Cava. The domed fountain was originally decorated with many sculptures but they were lost in the 1667 earthquake. Nowadays there are 16 carved heads through which water flows into a drainage pool. Today this fountain is a popular meeting point for locals and tourists. The fountain water is safe for drinking, so it is an ideal spot to fill up your bottle. If you are walking along the city walls, you will find some good points to photograph this fountain from above. 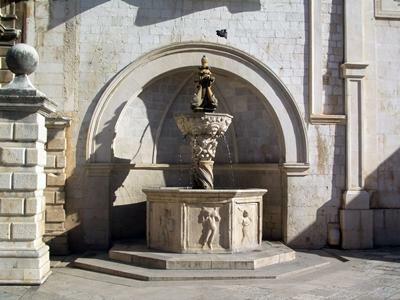 Onofrio's Small Fountain is located at the end of the Stradun, next to the Bell Tower. It is decorated with dolphins reliefs and carved heads and its function was to supply the market on Luza Square with water.